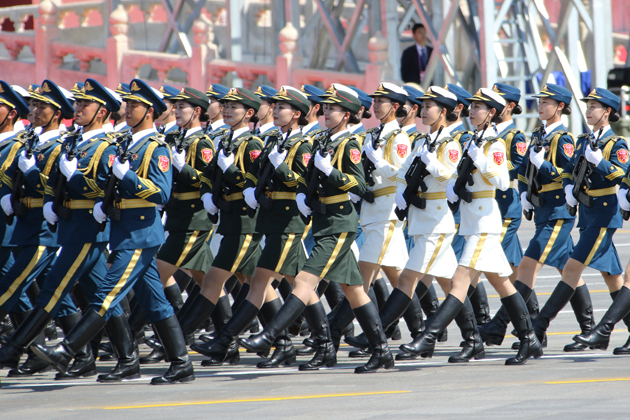 China held a massive military parade in Tiananmen Square, Beijing on 3 September. And with the longwinded title of ‘Military Parade Marking the 70th Anniversary of the Victory of the Chinese People’s War of Resistance against Japanese Aggression and the World Anti-Fascist War’, one knows it just had to be a grand spectacle. It was. 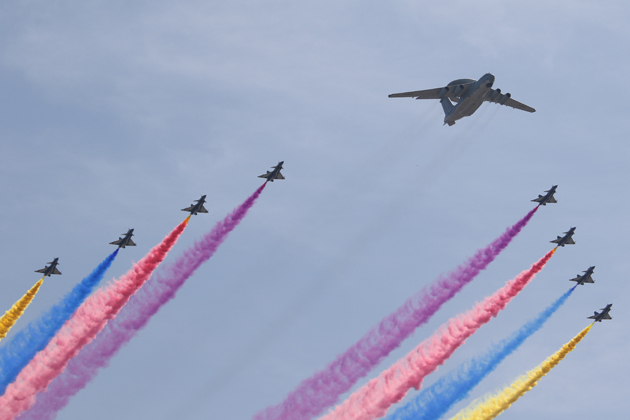 Featuring 12,000 Chinese troops and nearly 1,000 foreign soldiers, the parade boasted no less than 500 pieces of People’s Liberation Army (PLA) equipment. It was the largest ever air force display as well, with nearly 200 fixed-wing and rotary-winged aircraft participating. Of interest, 100% of the equipment involved was indigenously manufactured (though some, of course, was copied from overseas technology). The authorities also claimed 84% of the equipment had never appeared in public before. Given that the previous parade was just six years ago, that’s impressive! However, mixed messages emanated from the parade. The event was ostensibly commemorating the defeat of Japan in World War II by highlighting the military strength of China. The provision for spectators of ‘swag bags’ with peace dove symbols could not quite obliterate the image of military might that was being unashamedly presented. There was a little bit for everyone. 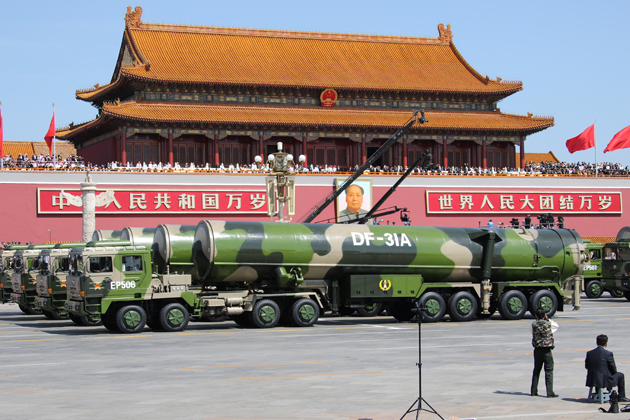 DF-21D anti-ship ballistic missiles able to target US aircraft carriers, armoured columns for neighbours on China’s land borders, while DF-15B short-range and DF-16 medium-range ballistic missiles were a subtle reminder to Taiwan ahead of presidential elections next year. In case Japan or Guam should feel left out, the brand new DF-26 ballistic missile, which may have an anti-ship variant, also appeared. And for everyone else, DF-5B and DF-31 intercontinental ballistic missiles are able to hit anyone in the world, the former with multiple independently targetable re-entry vehicle warheads. 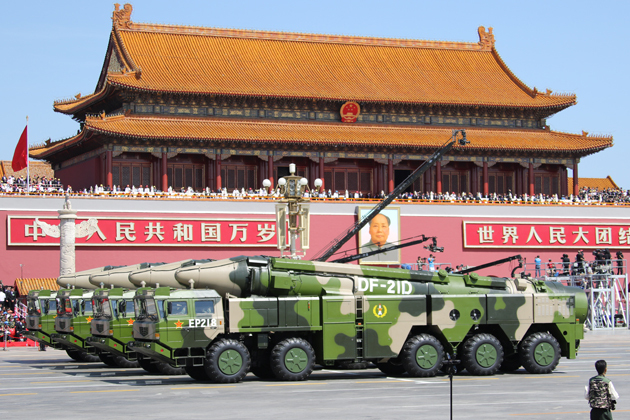 In an unprecedented speech at the start of the parade before inspecting his troops, President Xi Jinping stated, ‘I announce that China will cut the number of its troops by 300,000.’ This is to occur by 2017, with the Ministry of National Defence later stating the drawdown will affect ‘troops equipped with outdated armaments, administrative staff and non-combatant personnel’. Reducing the PLA by this number, more than the size of the complete UK armed forces, will result in the PLA possessing a mere 2 million troops. After the sound of main battle tanks, armoured vehicles, artillery pieces, missile systems, ballistic missiles and logistics vessels rolling along Chang’an Avenue had ceased, not even the release of hundreds of white doves at the end of the parade could quite remove the sound, taste and image of war preparedness. You have to admire the precision of it all. Driving clunky military vehicles 4 across in perfect alignment takes some doing! They’ve only been practising constantly for the past 2 months!